With the World Cup in South Africa recently, it has been an extremely hot summer for soccer fans all over the world but for movie producers, the past month has been more like a cold winter because their potential audience has been glued to the television watching matches. But one movie, Lost on Journey, a recently released blockbuster comedy, has bucked the trend and performed miracles during this tough time. 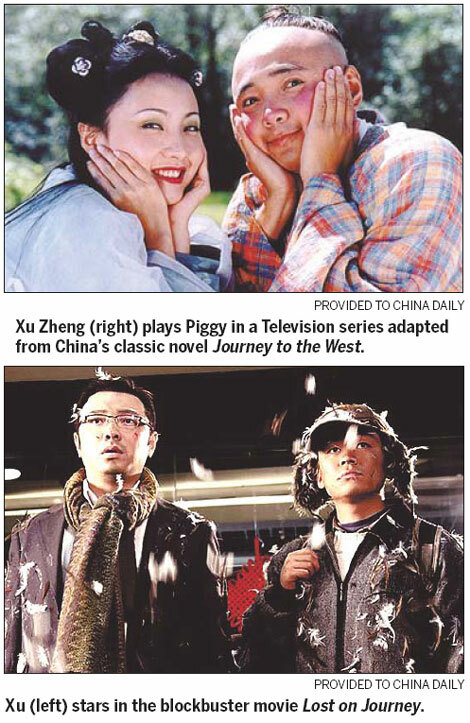 During the opening week, the movie topped the box office list of domestic films and earned 33 million yuan in two weeks. Xu Zheng, the actor who plays the leading role as the owner of a large company who experiences a series of embarrassing events, told METRO about his road from a shy boy to one of the nation's top comedians. Unlike some top stars who turn up late for interviews and who spend plenty of time in the make-up department first, Xu, who wore a simple T-shirt and shorts, showed up on time. His trademark bald head was shinning as usual but, unlike the dramatically funny man with exaggerated expressions on the big screen, Xu answered the questions seriously during the one-hour interview. "I envy those who can simply get through an interview by teasing and kidding," he said. "But I treat interviews and jobs rather seriously." Xu's acting career started on the stage of his primary school. Despite his rich stage experience, he said deep down he was a shy boy who lacked confidence until one day he shaved his head for a play during his second year at college. "I didn't know why, but I felt I found myself, the true me, with a bald head," Xu said. "My grades were poor at the time. I'm neither tall enough nor have a pretty face. Even my voice is not a typical theater voice," he said, mimicking a deep and resonant theatrical voice to make his point. Almost everyone around him tried to stop him from applying for a place at the Shanghai Theater Academy China, one of the most prestigious performing colleges in the country. "All of them thought I had too little talent for performing, but I just wanted to follow my dream," Xu said with a smile. However, in the two decades that have followed, Xu has striven to improve and has taken his gift beyond his own imagination. Since winning fame in 1999 by playing Pigsy, popularly known as Zhu Bajie, in a television series adapted from China's classic novel Journey to the West, his path to becoming the top comedian in China has been smooth. His work encompasses modern dramas, television series and movies. However, Xu doesn't want to talk about his remarkable history. "No actor wants to stay in the same position forever. We'd better leave the past in the past," he said. He is even reluctant to identify himself as a comedian, despite having developed many interesting and funny characters. "I don't want to typecast myself as a comedian," he said. A good actor can be anyone. He needs to put a lot of effort into his character, changing both inside and outside." Q: Who do you regard as excellent comedians? A: Charlie Chaplin and Stephen Chow. It is not just about their acting skills. Most of their movies focused on small potatoes, normal people and normal life. That's what I think a great movie should do. Q: What's the secret to making a great comedy? A: Making comedy is a difficult job. You need to be very sensitive to find out how to make people laugh. Great comedy doesn't only make people laugh but also has deeper meanings. People may have an epiphany after all the laughing. Q: What's the major difference between Chinese comedies and comedies in other countries? A: Chinese movie directors don't set the bar too high. They are easily satisfied by your acting skills. If you are famous that almost guarantees audiences, then they will have nothing to complain about. You have to push yourself to a new level. Q: Is there any character you desperately want to portray? A: Nothing in particular. If a story focuses on real life and real society, I will probably take it, comedy or not comedy. I plan to try as many different characters as possible. I don't want to limit myself. As an actor, I hope I can always develop myself in new territory. Q: As a Shanghai-born man, did you once say you love the people in Beijing and the city of Shanghai? Is that the reason you picked Tao Hong, a Beijing girl as your wife? A: No. I didn't pick my wife based on some sort of standards. A lot of people in the entertainment industry don't want to find their partners in the same world, but I don't mind it. We are actor and actress, so we have a lot in common. But I do prefer Beijingers to Shanghainese. Sometimes, Shanghai people are very disappointing. Q: As a person who travels between Beijing and Shanghai frequently, what you do think about Beijing? A: Beijing is officially a city full of desires. Shopping malls and flyovers are everywhere. You are either at home, at a mall or on your way to a mall. It is very difficult to for a person to communicate with the city when you have to drive most of the time. But in Shanghai, I often ride a bicycle to work and I can stop any time and visit any small shops on the streets.